The city is filled with nail salons and spas in every neighborhood, sometimes a few on the same block. Because of the abundance of choices, most of these shops must keep the prices low to attract new clients. In the East Village, there are a few nail salons that stand out for affordable prices, a clean space and quick yet efficient service. 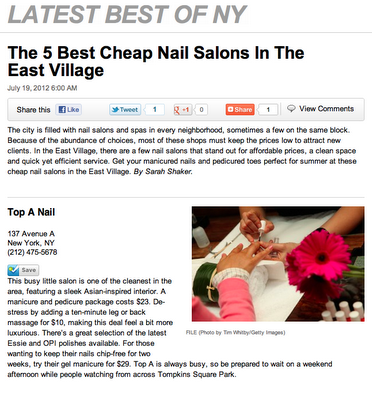 Get your manicured nails and pedicured toes perfect for summer at these cheap nail salons in the East Village.